Here’s what to do if you’re currently pounding reese’s peanut butter eggs. Or dove coconut filled eggs. Or massive Sarris’ truffle eggs. I could go on and on. But here’s what to do. Grab a big skillet and throw all the junk that’s in your fridge inside of it. You can even add the (faux peanut butter) eggs if you want. Personally I’d like to eat those adorable pastel foil wrapped chocolate eggs for every meal today, but I also would prefer to not hate life. You get it. Okay, so it’s been spring for like a month already and even though I was pushing for spring about two months before that, I finally feel like NOW it’s time. It’s spring, it’s spring! Okay no I’ll stop. I want to punch me in the face too. No rush summer. I mean, I did officially change my computer wallpaper to something rather beachy so it’s clearly a new season. And my hand has been hovering over the AC (I start to lose it at 72 degrees outdoors) but I haven’t pulled the trigger. Yet. 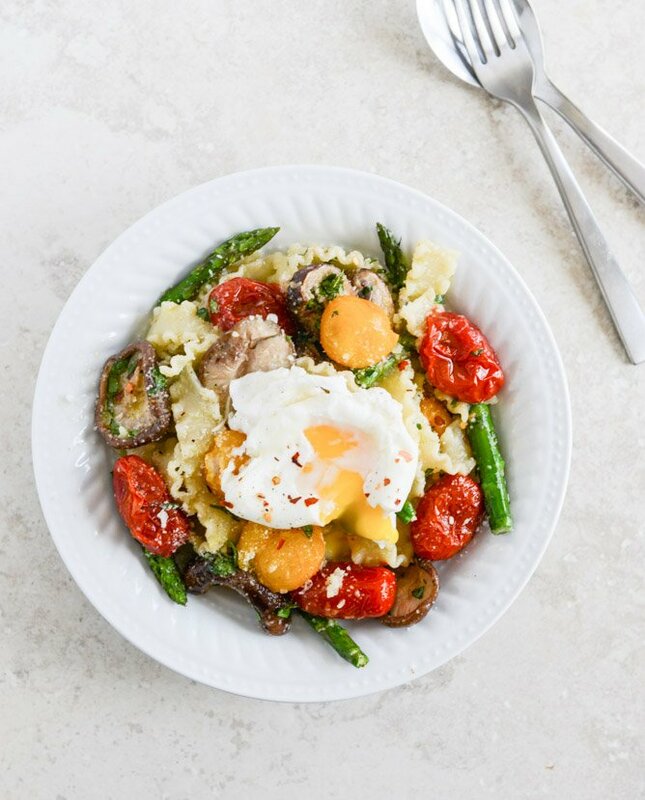 This mess is full of my current favorite things: mushrooms, asparagus, almost-popped tomatoes and… of course… eggs. Lots and lots of eggs. I will never quit the eggs. I get it. I overdo the eggs. But I could truly put them on anything and be thrilled with life. No hating it. 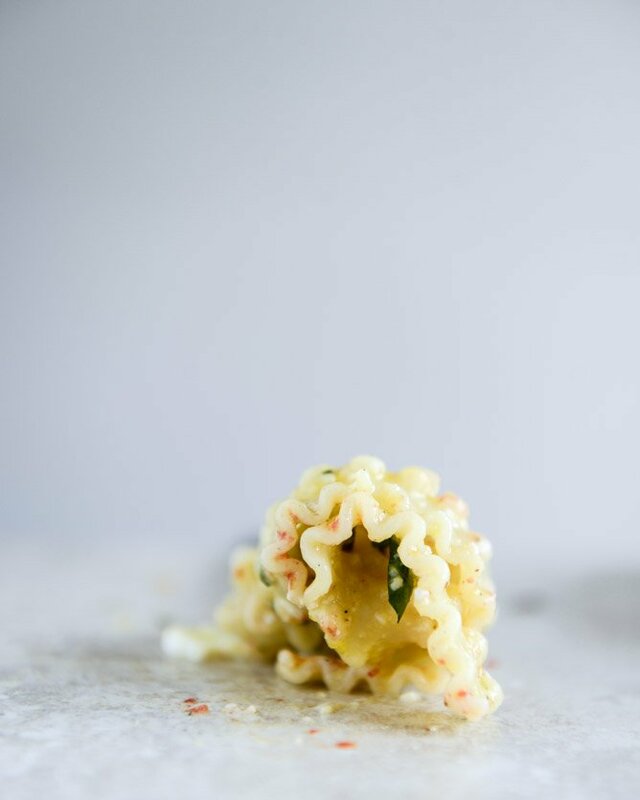 One of the reasons I’m so nutty over this dish is because the runny eggs mix into the pasta and create a delicious rich coating on the noodles. 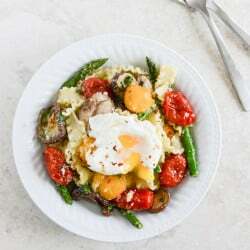 If you’re feeling frisky you could even just add a farm fresh yolk right down in the center of the whole shebang instead of a poached egg. But I was afraid of freaking people out. People being my husband. Who would think that he’d hate such a thing while really actually loving it but refusing to try it out of fear. You know. The norm. So we have: pretty little tomatoes that are shoved in the oven until they almost burst, but don’t. Garlic sautéed mushrooms and crisp asaparagus and noodles swirled in olive oil, fresh herbs and freshly grated cheese. And topped off with the softest poached eggs peppered with crushed red pepper. I need nothing else. Forever and ever. Preheat the oven to 425 degrees F. Add the tomatoes to a baking sheet and drizzle with olive oil, salt and pepper, tossing to coat. Roast for 15 to 20 minutes, or until the tomatoes are just about to burst. Remove from the oven. While the tomatoes are roasting, bring the water to a boil and prepare the pasta. Heat a large skillet over medium heat and add olive oil and butter. Add the mushrooms and stir. Cook, stirring occasionally, until the mushrooms are soft and juicy, about 6 to 8 minutes. Add in the garlic and asparagus, stirring to coat. Cook until the asparagus are green and vibrant, about 5 minutes. Stir in the pasta, tomatoes, parmesan, fresh herbs, salt and pepper. Toss well to coat and stir. Taste and season additionally if desired. 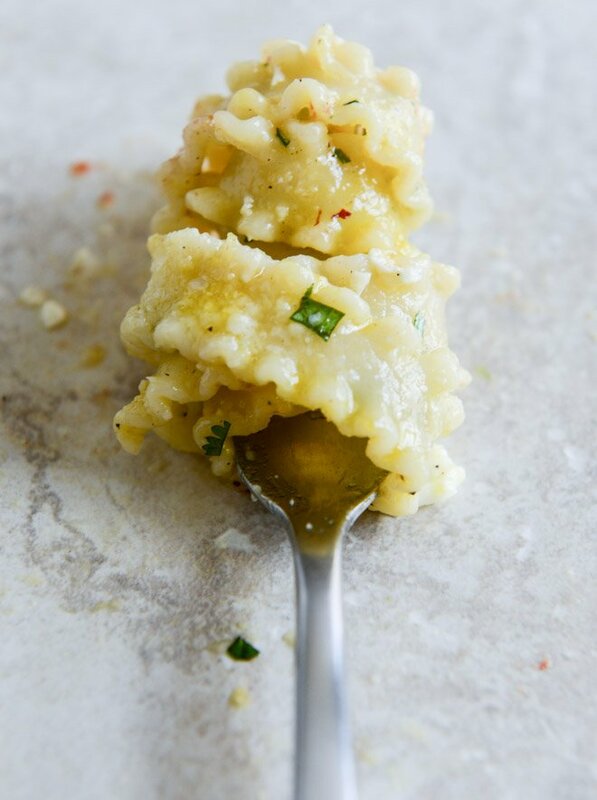 If the pasta seems a little dry, a few drizzles of olive oil and stir. 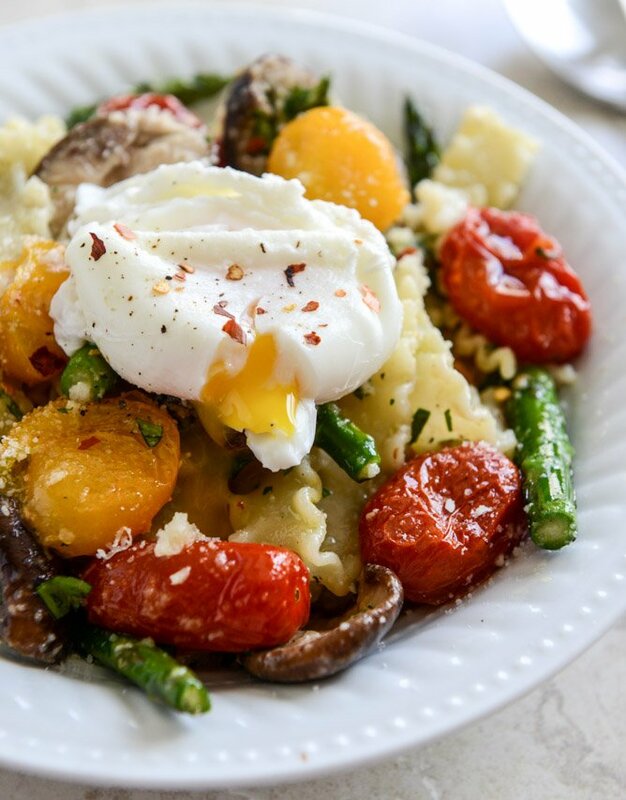 Serve topped with a poached egg and a sprinkle of crushed red pepper. see, now you can have a snickers egg. This was a fantastic recipe! Finally tried it last night…I did however add green onions and red pepper flake to the butter before sauteing the mushrooms for a little more ‘umph’ and I think it could have gotten a little kick with some lemon juice/zest or goat cheese so maybe I’ll try that next time…All in all, the family loved this one, thank you Jessica! Holy cow, this is amazing! A-ma-zing! The best thing I’ve eaten in weeks, and I do cook a lot. I used spelt instead of pasta, because I forgot to buy pasta, and because I love the slightly nutty flavour it has. I was almost too lazy to make the poached eggs, but I am glad I did convince myself to add them, they really took the whole dish to a new level of awesome. I’ll definitely make this again. And again. And again. And possibly again. ;) LOVE it. WOW! This looks like something I want to dive into and swim around in it with my mouth wide open the whole time. I’m going to have to make this as well, but then again when do I not want to make your recipes! The pasta looks good all by itself but oh the runny eggs. Yes and yes!! Made this last night and it was wonderful. I can relate to wanting eggs on everything, and also on over indulging on the chocolate ones. Happened to have all the ingredient minus the asparagus – even the fresh herbs, so made it but did a hard-boiled egg. LOVED IT. Had enough for two meals so LOVED IT twice!